Many bands since the demise of punk have looked back to the swinging sixties for their musical inspiration. They have managed to take the best things from that era and merge them with new ideas to produce a fresh, up-to-date sound. A Tamworth group, The Interviews, have been trying to do just that. Formed only three months ago, the band have already recorded a two-track tape and a national record company have shown more than a passing interest in their music. The Interviews are: Paul King, known as Kink, vocals and guitar, Steve Holland, lead guitar, Pete Williams, bass and Steve Parkin, drums. They recently recorded two of their songs, “I’m Leaving You” and “Count to Ten” at the Steve Adams Studio in Birchmoor. And I can honestly say that they’re two of the best tracks I’ve ever heard from a local band. It certainly makes a change to hear something other than the competent but occasionally repetitive heavy metal music, so popular at the moment. The songs are different from each other in approach but they’re both original – and exciting. “I’m Leaving You” is a bright, rhythmic item which flows along thanks to some neat musicianship and some excellent vocal work – the ‘sixties’ influence is clearly evident in this track. “Count to Ten” is, in fact, a sidestep from their usual material. It’s a tight, funky number, and Kink’s interesting singing voice is well to the fore. Both tracks have a good chance of commercial success and that’s why The Interviews are jumping at the opportunity offered by Virgin Records. They have invited the band down to their London offices next month to talk about a possible deal. I joined the band, I think, at its start after reading an ad for a bass player in the Tamworth Herald. 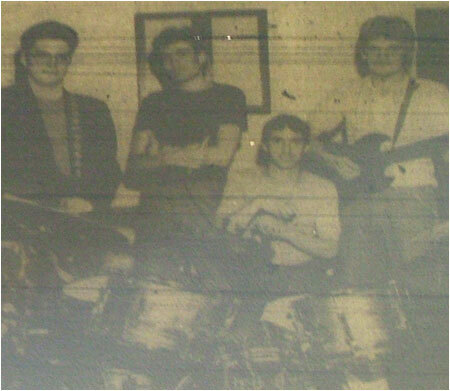 My previous band The Wipeouts had finished in the summer of 1980 as we had all gone on to higher education but as I was back in Tamworth at weekends I was looking for another Tamworth band to join. I'm not too sure of the dates but I think we started in either late 1980 or early 1981. Practicing was done either in the function room at the Amington Liberal Club or the Amington Inn - handy for the thirsty amongst us. We never quite had enough songs ready to gig with so we never played live, instead the plan was to make a demo and use that to attract interest. As with most Tamworth bands of the time the only choice was Steve Adams' studio. I'll always remember getting to the time to mix the tracks where Mr. Adams pulls out and plays a Steely Dan LP to get the right 'vibe' to mix to - this should have been the cue to leave. I've always remembered that Steve, Steve and Paul were an experience if you agreed to a night out in Tamworth. I left the band in September 1981 to work in Southampton for 5 months as part of my college course. I'm not sure if I was replaced at the time but the two Steve's tried to re-form the band in 1982 with me included but I was too busy being a full time student with another period of work experience somewhere in the country looming. The Interviews...bringing the sixties sound up-to-date. From left to right are: Pete Williams, Paul King (Kink), Steve Parkin and Steve Holland. The full profile and history of The Interviews has yet to be added to TamworthBands.com Call back soon to read the full band details.